Learn how to make quick and easy chocolate caramel apples recipe for Fall/ Thanksgiving parties. Fun to make with kids! Lots of tips and tricks included! Fall is all about enjoying apples in our house, especially these chocolate caramel apples as well as this mini apple strudel recipe or this caramel apple pie. Ooooooo….if you have ever been to Rocky Mountain Chocolate Factory, my recipe tastes just like the ones you would buy from there. Yum! How do I make caramel apples at home? 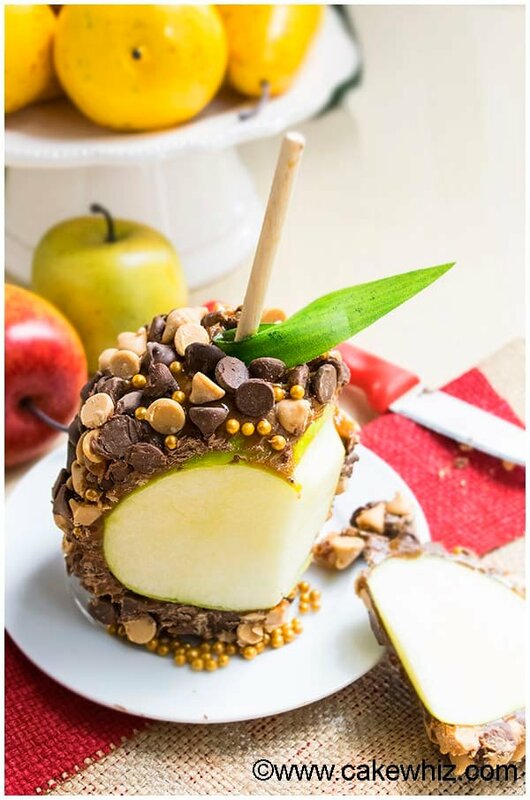 How to make gourmet chocolate caramel apples? Then, you push a sturdy wooden stick through them. Dip them in melted caramel. Dip them in melted chocolate or cover them in chocolate chips. If eating the whole apple sounds too messy, then wait till the caramel and chocolate has firmed up. Then, cut SLICES with a sharp knife. This way, you can enjoy slices! Use smaller apples to make lollipops, which is also easier to kids to enjoy. How to store homemade caramel apples? Place them in a box with a tight cover and store in the refrigerator. Do not store at room temperature! Personally, I like to take them out of the fridge and keep them at the countertop for 15 minutes and then enjoy them. This makes them so ooey gooey! How long do chocolate caramel apples last? How long can you keep caramel apples? Since you are puncturing the apples by pushing a wooden stick through them, I would say these can only last for 3 days . How do you make caramel for caramel apples? You need really thick caramel and I melt caramel candies instead of making it. It’s easy and never fails. I have a homemade caramel sauce recipe but it has a thinner “syrup-like” consistency that’s not suitable for dipping these apples. What apples are best for caramel apples? What apples are best for dipping? Granny Smith or Honeycrisp apples are the best! Are caramel apples good for you? They have a lot of sugar because of caramel and chocolate chips, which means they are best enjoyed in moderation. Remember to WASH apples properly to remove that waxy residue or you can just use organic apples. To remove wax coating, all you have to do is mix 1 cup of boiling water with 1/2 teaspoon white vinegar and then dip each apple for 4-5 seconds. Dry thoroughly with kitchen towels and that’s it! Make sure to use GOOD QUALITY ripe apples and good quality chocolate chips. Your chocolate caramel apples are only as good as the ingredients you use. These apples will get heavy! So, you must use thick wooden popsicle sticks or wooden lollipop sticks. DON’T use plastic lollipop sticks or thick straws! I tried them and they were breaking and bending and absolutely useless. 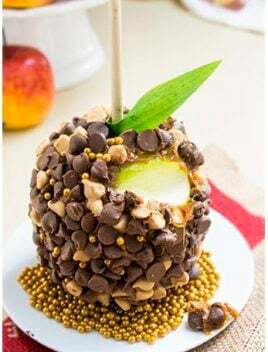 I used dark chocolate chips and peanut butter chips in these apples but feel free to use white chocolate chips and then you can enjoy white chocolate caramel apples. You can include more add-ins in these candy apples by tossing some sprinkles, coconut, cinnamon sugar, candies, chopped Oreos and graham crackers and even chopped nuts (almonds, pecans, walnuts). If you have leftover melted chocolate or caramel, you can use that for additional DRIZZLING on top of these apples. You may need more or less chocolate and caramel, depending on the size of your apples. I like to use big apples and I always end up with leftover melted chocolate and melted caramel. But honestly, I prefer having more on hand since I don’t want to worry about running out halfway and then melting again. It’s so annoying. 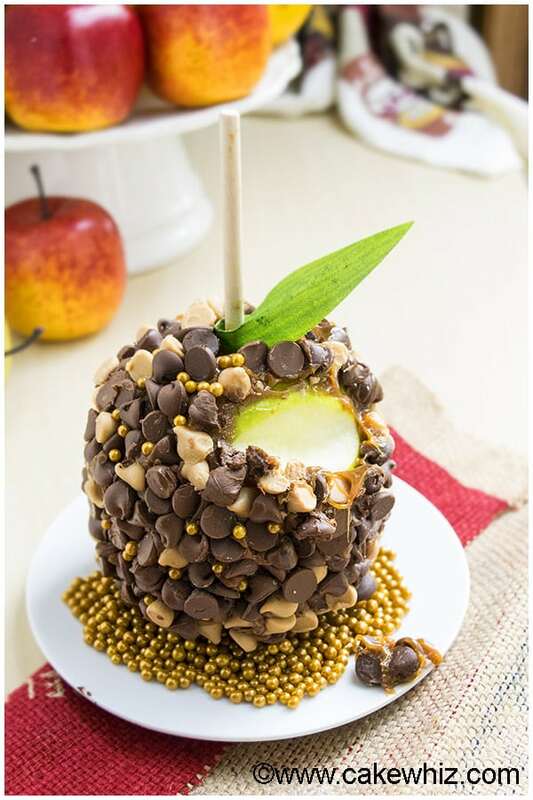 Learn how to make quick and easy chocolate caramel apples for Fall/ Thanksgiving parties. Fun to make with kids! Lots of tips and tricks included! Wash your apples and pat them dry with paper towels. Push wooden lollipop sticks into each apple. Now, melt caramel in the microwave or a saucepan. Remember to use a deep bowl, which makes it easier for dipping. Dip apples, one at a time, in the bowl of melted caramel. Place them on a cookie tray lined with wax paper. Place tray in the fridge for 15 minutes so that the caramel sets up a bit. Remove tray from fridge and cover all the apples with chocolate chips. Fill any gaps with golden edible pearls. Place the tray in the fridge again and let the caramel and chocolate chips set for 45 minutes. Prior to serving, stick a small craft paper leaf on top of each apple. You will just have to push the leaves in slightly and they will stick to the caramel. Enjoy! Read all my tips and tricks above. Store leftovers in the refrigerator and try to finish them off within 3 days. 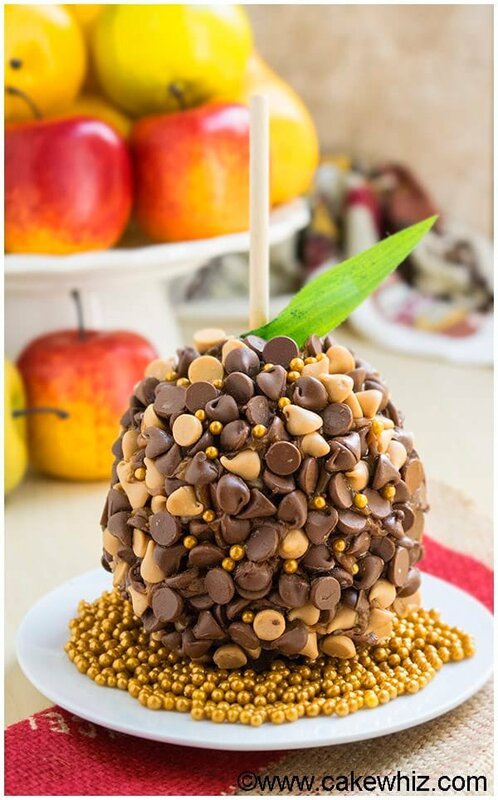 I want to eat this CHOCOLATE CARAMEL APPLES daily! Yummy! Cannot wait to try this. Thank you for a great recipe! This is really gorgeous! Such a great idea!